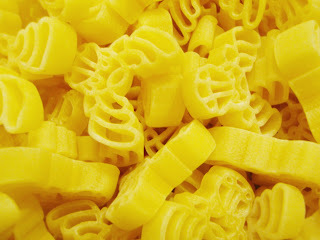 It is a scientifically proven fact that fun pasta shapes taste better than traditional, boring ones. In my test kitchen I have been researching my Fun Pasta Theory for years, and would go so far as to say that there exists a hierarchy in the land of noodles. Spiderman Kraft Macaroni and Cheese is tastier than the spiral kind, which is tastier than the standard elbow macaroni, and so on. I have consumed carbs resembling Mickey Mouse, bunnies, and shells, but the most exciting pasta shape yet, and of course by my logic the most delicious one, is the moose pasta they sell at IKEA. Oh IKEA, you are an endless source of inspiration, provided I am not in a hotdog and soft serve induced coma when I leave. I’ve decided the best use for the moose was to make a huge dish of mac n’ cheese, my all time favorite comfort food, and I do believe it turned out perfect. 1. Cook the pasta in boiling water until tender. Use a large pot, because you’ll use it to mix everything together at the end. Grease a large casserole dish (about 2 ½ qt.) with butter and preheat oven to 350°. 2. Grate the cheese in a large bowl. Peel and chop the onion, then add it to the bowl of cheese. Then add sour cream, mayo, and pepper and mix until well integrated. 3. Drain pasta and return to pot. Use a spatula to scrape the mixture into the pot, then mix until smooth. It’s best to do this while the pasta and water pot are still pretty hot. 4. 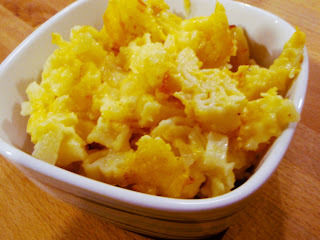 Pour macaroni and cheese into the greased casserole dish and sprinkle with paprika, Bake uncovered for 40 minutes. Make sure you get a block of cheddar and grate it yourself. It only takes a few extra minutes and the result is well worth it (and it’s cheaper). Bagged, pre-grated cheeses are too dry and don’t melt as well. In fact, if you’re going to use bagged shredded cheese despite my warning, you do not have my blessing. 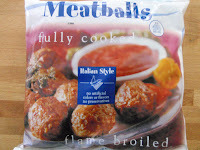 Serve with Trader Joe’s (or in this case, Trader Giotto’s) Italian style meatballs. You can find them in the freezer section. They’re already cooked, so I usually just throw them in the microwave for a few minutes with a damp paper towel on top to keep the moisture in. You know, Moose are like 7 Feet tall and way a couple tons!! !